Gothenburg (or Göteborg in Swedish) is the second-largest city in Sweden, home to Volvo, a busy port town by the sea, and a foodie destination. Gothenburg is located on the west coast of Sweden, southwest of Stockholm. Gothenburg’s points of interest are mostly centered in the city center, but travel by tram and bus outside the city center and you will find some pretty unusual off-the-beaten-path attractions too. We’ve put together the following guide of 48 hours of things to do in Gothenburg to get the best out of this Swedish city in a short period of time. If you have a short time in Gothenburg, a great way to get a quick overview of the city is to board the Strömma bus on the main boulevard Avenyn outside Stora Teatern (free with the Gothenburg City Card). Earphones are provided and the recorded commentary is available in English, Swedish, Norwegian, Danish, German, French, and Spanish. During the low season, when we visited, the tour is every Saturday at noon and takes 50 minutes with no stops. During the high season the tour becomes hop-on-hop-off with a total of seven stops. The story of Gothenburg from ancient times to present day is told at the Gothenburg City Museum (Göteborgs Stadsmuseum). The museum’s collections range from photographs to furniture to clothing and more. Its claim to fame is having the only Viking ship on display in Sweden. The Äskekärr ship is 16 meters long and was found 30 kilometers from Gothenburg in the 1930s. It was used as a trading vessel around 900 AD. Admission to the Gothenburg City Museum is free with the Gothenburg City Card. Since our time was short in Gothenburg, we almost skipped the Gothenburg Museum of Art (Göteborgs Konstmuseum), but after a few conversations it became apparent that just wouldn’t be acceptable. The Gothenburg Museum of Art contains one of northern Europe’s finest art collections from the 15th century to present. While there are works by famous artists like Rembrandt and Monet, the museum’s focus is Nordic art. While many European museums have art collections that started as royal collections, Gothenburg’s art museum was created with donations from the people of Gothenburg. Entrance to the museum is free with the Gothenburg City Card. The Gothenburg Museum of Art is along Götaplatsen, Gothenburg’s public square, which is dominated by a statue of the sea god Poseidon who stands holding a shell and a fish while overlooking Avenyn. Also along the square are the Gothenburg Concert Hall and Gothenburg City Theatre. Here’s where this guide to Gothenburg goes a little off-the-beaten-path, and why the internet, with photos and travel blogs, is such a wonderful thing for travel research. Mölndals Kvarnby barely gets a mention in our guidebook, but for us it was one of our favorite things to do in Gothenburg. The only reason we found Mölndals Kvarnby was because I did some internet research to see if there was anything else to do near Gunnebo Slott (described below) and found this beautiful town built on top of a waterfall. Mölndals Kvarnby is a neighborhood of Mölndal in the southern outskirts of Gothenburg. The buildings are built along and on top of fast moving rapids. The strength of these rapids was harnessed to power mills hundreds of years ago. These mills were used to create everything from textiles to paper to oil. At the top of the neighborhood is the City Museum of Mölndal (Mölndals Stadsmuseum) which displays everyday items from the 20th century. Enjoy lunch at the museum and grab a free map of the neighborhood (only available in Swedish during our visit). Be sure to stop at the Industrial Museum (Industrimuséet) which houses an eclectic collection of industrial machines as well a replica of an old residence. Gunnebo House and Gardens (Gunnebo Slott) is an 18th century estate in Mölndal (reachable from Gothenburg’s city center via tram and then bus). In 1778, John Hall, a merchant, hired the renowned Gothenburg architect Carl Wilhelm Carlberg to build him a summer estate south of the city. Carlberg not only designed the building, but also the furnishings. Each room had its own unique style all the way down to the chairs. Carlberg was inspired by Italian design and the estate is a great example of neo-classical architecture. John Hall died in 1802 and his son, John Hall Junior, inherited the estate and his father’s business. John Hall Junior was an artist and not a businessman. He was unable to maintain the business and went bankrupt in 1807. Gunnebo fell into disrepair and John Hall Junior lived in poverty until he died homeless on the streets of Stockholm. The house was auctioned off in 1832 and changed hands many times. The city of Mölndal was able to purchase the estate in 1948 and restored it to its former glory based on architectural drawings. Some of the original furnishings have been reclaimed while others have been recreated. Today Gunnebo House and Gardens can be visited on a guided tour which is free with the Gothenburg City Card. According to the website, tours are given in Swedish while non-Swedish speakers can follow along using provided guidebooks in English, German, French, Spanish, and Russian. However, during our visit the guide provided the tour to our mixed group of Americans, Frenchmen, and Swedes in English. Gothenburg is a culinary city by the sea. The cold waters of the North Sea cause the fish and shellfish to grow slower and also develop fuller flavors. To fully enjoy the fruits of Sweden’s sea, visit Feskekôrka, which translates to fish church. Feskekôrka is an indoor fish and shellfish market housed in a market hall that was built in 1874 in the shape of a church. The seafood in this market is worthy of worship. While locals come here to buy fish for home, travelers need not despair. The market has a couple of restaurants at which travelers can dine on the freshest Swedish seafood. We dined at Restaurang Kajutan for lunch and ate a glorious sampler platter with two kinds of herring (including one made with lingonberries which I recommend for the non-herring lover), oysters, prawns, shrimp, crab, lobster, salmon, and more. Seafood isn’t the only culinary delight to be found in the foodie city of Gothenburg. Gothenburg chefs work with local, organic, seasonal ingredients like berries, mushrooms, and game in gourmet restaurants around the city. Gothenburg has six Michelin-starred restaurants, two of which were added in 2015. We dined at Gothenburg’s newest Michelin-starred restaurants, SK Mat & Människor and Koka. The others are Thörnströms Kök, 28+, Bhoga, and Sjömagasinet. Gothenburg Travel Tip: To get the most out of Gothenburg on a budget, grab a Gothenburg City Card at the airport, from a tourism office, or order online to receive free entrance into attractions, free travel on public transportation, and free parking. 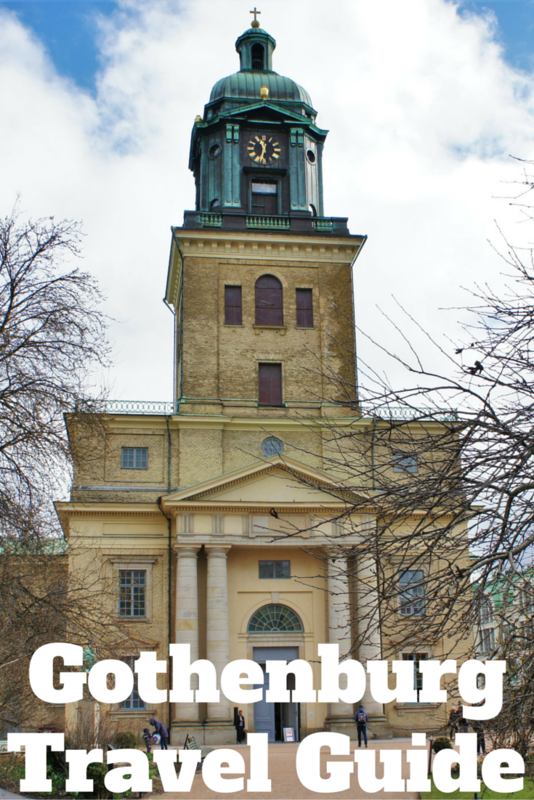 Almost all of the things to do in Gothenburg listed above are covered by the card. The Gothenburg City Card even covers things like rental bikes, available at over 50 stations around the city, and a guided boat ride through Gothenburg’s archipelago. Gothenburg City Cards are offered in 24-, 48-, and 72-hour durations. Thank you to go:teborg&co and Hotel Bellora for hosting our time in Gothenburg and making this post possible. As always, all opinions are my own.